Enrico Rava and Tomasz Stanko are undoubtedly two of the most important voices in European Jazz. Both ECM artists, they maintain a busy touring schedule performing year round throughout the world in the most important and prestigious clubs, festivals and theaters. They are each considered among the founders of modern European Jazz. 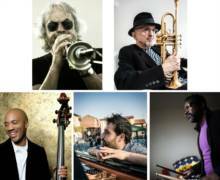 For the first time they will be co-directing a project mixing European and American musicians: The two trumpeters will be accompanied by New York-based musicians Dezron Douglas on bass, Gerald Cleaver on drums and Italian pianist Giovanni Guidi. This is no jam session or trumpet battle, but rather a profound exploration of the unique musical worlds of two of Europe’s greatest talents, an unpredictable mix of strong personalities whose ability to lead a group and tell a story through their horns is unsurpassed. These men are known as soloists but they also know how to support and leave space for their formidable rhythm section, each musician extroardinarily sensitive and creative, contributing both as soloists and as accompanists. Enrico Rava, constantly on the lookout for new and exciting musical experiences, exploded onto the scene in the mid sixties, rapidly rising to fame as one of Europe’s most important new voices. His wry humour and honest communicative style are expressed both in his personality and in his music, and he has earned a reputation as an iconoclast, constantly open to new experiences and thinking outside the box. His style is immediately recognizable, exquisitely lyrical and expressive but always fresh and inspired, distinctive in all of his musical adventures. Tomasz Stanko, composer, trumpeter, improviser: as much in live as in music. He debuted at the end of 1950s in Krakow, in communistic then Poland. Jazz was the synonym of freedom. Always having his unique sound and language, Stanko is now universally considered one of the most important and original jazz musicians worldwide. At 75 years of age, the trumpeter hasn’t lost any of his characteristic desire to innovate and try new musical experiences, open to risk but maintaining a rare artistic integrity over the course of his career. He is an important innovator in European improvised music, but has not turned his back on jazz as a style and a musical language in which his own music is deeply rooted. Dezron Douglas and Gerald Cleaver are one of contemporary jazz’s most constant and creative rhythmic teams on an international level. Their collaborations are numerous and varied: Douglas has worked with Eric Reed, Louis Hayes, Ravi Coltrane, Cyrus Chestnut Cleaver has no less impressive resume, having worked with Roscoe Mitchell, Miroslav Vitous, Charles Lloyd, Craig Taborn , Eric Revis, William Parker. The quintet’s youngest member is 32-year-old pianist Giovanni Guidi, who has been playing with Rava since he was 19. He is making an important name for himself as a leader as well, constantly expanding his musical horizons and developing his distinctive musical vision as improviser, composer and bandleader. Guidi recently released his third album for ECM.